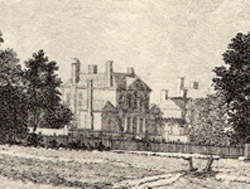 In 1771 Paul Vaillant III, bookseller and magistrate, bought the Twickenham House Estate from Sir John Hawkins. They are claimed to have known each other well, to the extent that Vaillant christened one of his daughters Letitia, as did Hawkins. He was of a Huguenot family: Francois Vaillant and his wife Jacqueline Guillemin and 5 children fled Saumur for England in 1685 on the revocation of the Treaty of Nantes. Francois started his bookseller’s business in the following year, perhaps with his brother, Paul. His sons Paul II (1672-1739) and Isaac joined the business at 82 Strand and, in 1707, were granted citizenship under the Naturalisation Act as “Petitioners obliged to leave France on account of being Protestants” (House of Lords, Journal Office: Main Papers 2411, ref: HL/PO/ JO/10/6/131). Francois died in 1721, desiring to be buried in the churchyard of St Mary Le Savoy, next to his deceased wife. By his will (PCC Prob 11/579, translated from the French) he bequeathed his estate to be divided equally between his five children: Paul, Francis, Isaac, Susan and Mary, but. Francis was not to receive his share: it was to be administered for the benefit of his two children William and Susan, “excluding their father Francis Vaillant from any claim thereto”. Furthermore, if Isaac died without issue his share was to revert to the two children of his son Francis, who may have caused displeasure Francois’ brother, Paul I, died in 1722. He made his will in 1709 (PCC Prob 11/587, translated from the French), a short, terse document, desiring to be buried in the graveyard of St Paul’s, Covent Garden, leaving his few worldly goods to his wife, Mary Magdalen (most of which were hers anyway) and a shilling to Francois or his heirs. In fact, Francois had died in 1721, but the trivial bequest suggests there was no love lost between the brothers at that time: Paul was disinheriting his brother, for some reason. Paul II settled in Battersea, married Frances Motet in 1714, and their son Paul III was born in 1716. He entered the business, continuing after his father died in 1739 and becoming a proprietor when his uncle Isaac retired in 1750. He appears to have traded in partnership with Peter Elmsley (1735-1802), though retiring from the business in 1768. It had acquired a considerable reputation. Magistrate and Sheriff of London and MiddlesexHe became a magistrate and in 1759/60, a Sheriff of London and Middlesex. He was also admitted to the Stationers Company, of which he became the Master. As Sheriff, on 5 May 1760 it fell to him to oversee the execution at Tyburn of Laurence Shirley, 4th Earl Ferrers, for the murder of his steward in January that year. Ferrers' trial, by his peers, in Westminster Hall had caused a sensation, unabated when the death sentence was carried out. The earl was driven to Tyburn in his own coach, by his weeping coachman, accompanied by Sheriff Vaillant and the Reverend Cornelius Humphries, chaplain to the Tower. Because of the crowds the journey took two and a half hours. On the journey, the earl presented Paul with his watch and chain together with other personal items. These were important to Paul and later, in his will, he asked his wife not to sell or dispose of the watch which was “given to me by Laurence Earl Ferrers but to leave the same at her decease to one of my children as she shall think most likely to continue it in my family.” The watch and chain were still in the possession of a member of the family in 1922. Vaillant wrote an account of the whole event and, remarkably, it was in the hands of Horace Walpole on 7 May when he wrote a long letter to Horace Mann, describing in detail the events of that day as recorded by “Vaillant, the French bookseller in the Strand”. When Paul Vaillant came to Twickenham House in 1771 he would have known just how near he was to Heath Lane Lodge, owned by the Shirley family since 1714. Sir Robert Shirley, 1st Earl Ferrers had died in 1717, leaving his widow and 10 children. She died in 1762 but in 1771 her son the Hon George Shirley (1705-87) still owned the property. Other members of the family enjoyed continued association with Twickenham, in particular Lady Frances Shirley. The execution, 11 years earlier was a sensitive issue for the family and remained so for many years. At Twickenham there may well have been tension, although none is recorded. However, in 1772 Paul was elected a trustee of the Isleworth to Teddington Turnpike which passed through Twickenham and along Cross Deep. George Shirley, as a riparian owner, was already a trustee, but seldom attended meetings. In 1778 he applied to the trustees for permission to dig a tunnel beneath the road, linking his garden to his riverside meadow. He was refused by a unanimous vote in which Vaillant took part. Paul married twice and three children survived from his first marriage: Paul IV, Isaac and Mary. There may have been a fourth who died young: Letitia. His wife appears to have died and on 14 August 1760 he married for the second time, Theodosia Wichcote at St Clement Danes in the Strand. There were five children of this marriage: Elizabeth Theodosia, John, Frances, Philip and Letitia. Theodosia was the niece of John Sydenham JP (1693-1775) who is recorded living in Sion Row between 1769 and 1764 when he moved to Ragman's Castle along Riverside, next to Orleans House. He was descended from Dr Thomas Sydenham of Wynford Eagle, Dorset, after whom the Society is named. His grand-daughter Ann inherited and married Theodore Whichcote. There was another local connection: Elizabeth Theodosia, married Nathaniel Gostling on 19 November 1785, at St James, Piccadilly. Nathaniel was one of the 19 children of George Gostling I (1714-82) of Whitton Park. Two sons only of the late Paul Vaillant are noticed. But his eldest son, Paul Vaillant Esq., the issue of a former marriage, is now living at Hexham in Northumberland. He was sent down there, upon an annual allowance, some 50 years ago; and married the daughter and only child of Mr Downes, an Attorney, who, at his death, left them a plentiful fortune. She is since dead, and he is married again. There is a record of Paul IV's second marriage, to Mabel English, on 21 July 1809, at Hexham but little of this tantalising story is known yet. He may have been born in 1739, dying in about 1818, leaving daughters. There are references to his life in Hexham: property transactions in 1811 and following his death and, curiously, a legal action in 1799 when he was indicted at Northumberland Quarter Sessions for failing to maintain the Durham to Hexham highway (A2A, Northumberland Record Office, ref: NRO672/A/1/9/90 & 91, 28 Feb.1811 and QSI/453 respectively). Paul's son Philip, by his second marriage, entered the church, being ordained priest in 1791. He died in 1846, vicar of Stoke D'Abernon in Surrey. Paul enjoyed family connections here: his father had lived, and died at West Horsley, nearby and Paul acquired the advowson in 1800, intending, as set out in his will, that Philip should be presented to the living should it become free, which it did in 1801. Paul bought numerous tracts of land for an estate at Hemel Hempstead and Berkhamsted Common between 1757 and 1800. Also, in 1775 he appears to have acquired the manor of Kings Langley nearby. He sold Twickenham House in 1800. A wealthy man, he made his will in 1798 (PCC Prob 11/1370 & 1371), a long and repetitive document, providing in various ways for his wife and eight children though, in the case of Paul in Hexham only £50 for a mourning ring. Curiously, he asked to be buried quietly in what he described as “my family vault at Stanmore in Middlesex”. His connection with Stanmore has not been established but, if it was the church of St Laurence at Little Stanmore, there might have been an earlier relationship with its incumbent, the Huguenot John Theophilus Desaguliers. Dear Sir. I am very much obliged indeed again for your kindness in sending me these two nice accounts of Twickenham House & Whitton Park and I thank you very much indeed…..I enclose you a little pamphlet I wrote on our family & you will see therein Paul Vaillant's Twickenham notice. I fancy the Hawkins were great friends of the Vaillants. Sir Caesar Hawkins lived next to Paul Vaillant in Pall Mall and Paul Vaillant named two of his daughters Letitia, we think after Letitia Hawkins. You record her tablet in Twickenham Church next of course that of George Gostling. Letitia Hawkins succeeded John Sydenham in his big house at 4 Sion Row (actually no2). He was the uncle of Mrs Paul Vaillant who was Miss Theodosia Whichcote. John Sydenham was a rich man and the grandson of the celebrated Dr Thomas Sydenham of Pall Mall: see DNB. I am very interested in the facts you kindly give of Miss Letitia Hawkins Anecdotes. I have never heard of the book & wd much like to see it perhaps very likely there wd be references in it to both Vaillant and Gostling. I suppose it is not noticeably literary. Lately I looked up her will in which she mentions a poem written by Sir John Hawkins on Mr George Gostling & bequeathed by her to her Father's College library at Cambridge! Paul Valliant was a celebrity of his day - a friend of Horace Walpole - & the Father of the Stationers Company. A rich man, and his wife the heiress of the Sydenhams. He was Sheriff of London in 1760 & so had to attend the execution of Earl Ferrers at Tyburn. All the relics of which execution I have including the Earls watch and chain presented on the scaffold to …. Paul Vaillant. His daughter married Nathaniel Gostling in 1786. He was the son of (one of) the 19 children of George Gostling, and he ought to have inherited Whitton but scandalously the entail was raised by the daughter of the then Rector of Egham (John Whalley Gostling [1787-1838]) and the property and everything sold, but I have notary papers here now by the about it. The present heir wd be my cousin Lt Col Gostling of Bath who so terribly regrets his family property went. The reference you kindly send is that of the Father of Paul Vaillant (both were Paul) and you will see him too in my booklet. He did not live at Twickenham House. There is a mistake in the account of Twickenham House, at least Paul Vaillant died 1802. It was Mrs Paul Vaillant who had lately resided there then in 1816. Can you tell me who built Twickenham House and what the name Whitton means.